The ALPS Mountaineering Meramac is a great starter tent and perfect for car camping or a weekend backpacking trip. It’s super affordable for the quality and versatility you get. I purchased this tent on a tight budget and little time to do significant research. From what I gathered off a quick search and prior knowledge of ALPS Mountaineering, I figured I couldn’t go wrong for $75. Since purchasing the tent, I have used it about a half a dozen times and have not been disappointed yet. It’s a solid 2-season tent that I frequently use when car camping. Floor Dimensions: 7 ft. 6 in. x 5 ft. Setting it up is a breeze! I am able to set the entire tent up by myself in less than 5 minutes. 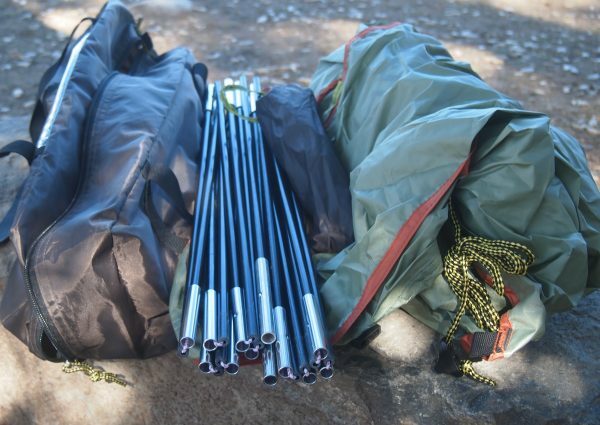 Breaking it down and getting to it to fit back in the bag, is just as easy. I am even able to fit the tarp I use as a tent floor in the bag as well. 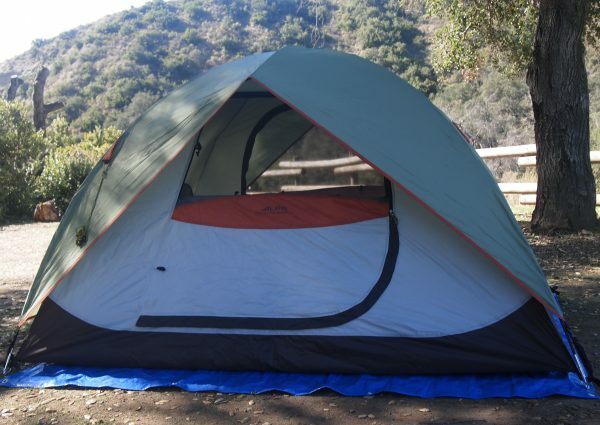 The tent also has two doors which are super nice when multiple people are in the tent and need to get up in the middle of the night – no more crawling over the other person to use the restroom. In addition to the two doors, it has two windows and two mesh panels. The windows are on the doors and can be zipped opened or closed, while the panels are at the head and foot of the tent and cannot be closed. The panels and windows definitely help with condensation. I haven’t had an issue yet even when I heat the tent up with my Little Buddy before getting in. 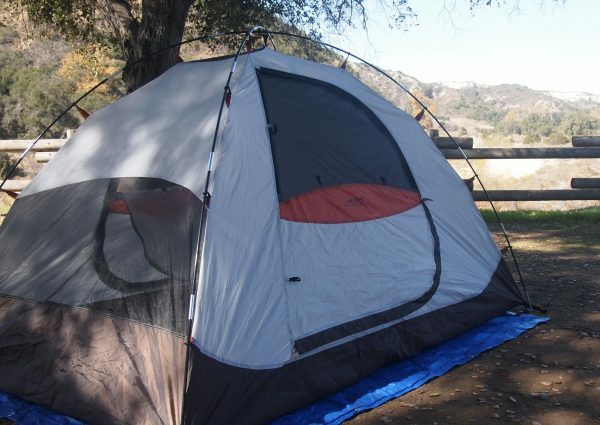 The cost of the tent makes it a no-brainer for me since I really only needed it as a back-up and if additional friends or family join me on trips. The weight is not ideal. It’s a bit too big and heavy for backpacking but if you aren’t traveling far or too long by foot you can definitely use the Meramac Tent. The open panels are definitely another drawback. They truly make this a 2-season (3 if you have good sleeping bags and proper equipment) tent. In addition to making the tent susceptible to cold weather, the panels do worry me if I were to get stuck in heavy rainfall. I have used the tent in some mild rain without leaking issues but I would be hesitant in heavy rainfall and excessive wind conditions. The ALPS Meramac Tent definitely accomplishes what it was designed to do – be an affordable, easy-to-use tent. 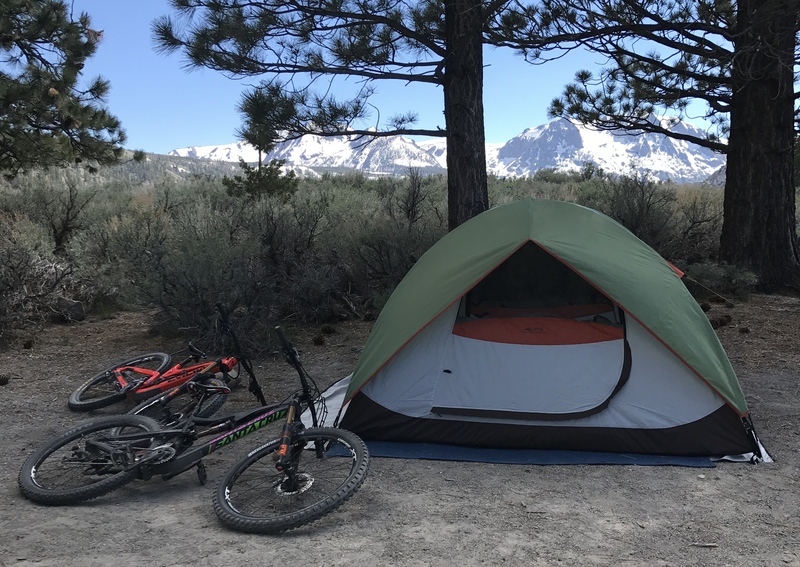 Though I normally use a roof-top tent, I frequently use and bring the ALPS along on camping trips because it’s so versatile and would recommend it for families, beginner campers, and those looking for an affordable and easy-to-use option.